So recently I created a new SSAS memory report that you can use to analyze the memory usage of your SSAS servers, read more on the actual report here. In this blog post we’ll look at how this report was build. And more, but with the above we should be able to make a great report. Unfortunately there is one issue, the query above can only be send per database not for the entire server. This used to be a problem with the previous memory reports but with PowerQuery we can solve this. What we will do is do a second discover that will give us all the databases on the server “DBSCHEMA_CATALOGS”. Here we will also filter out any database that doesn’t have the compatibility level 1200 or higher. We will then use the results of that query to send the DISCOVER_STORAGE_TABLE_COLUMN_SEGMENTS per query. 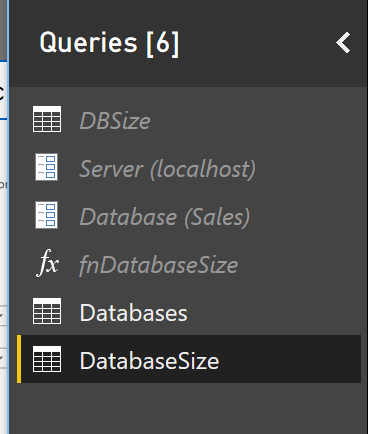 So to build this the first thing I did was create a query in Power BI desktop that will give a list of all the databases on my server using “DBSCHEMA_CATALOGS”. 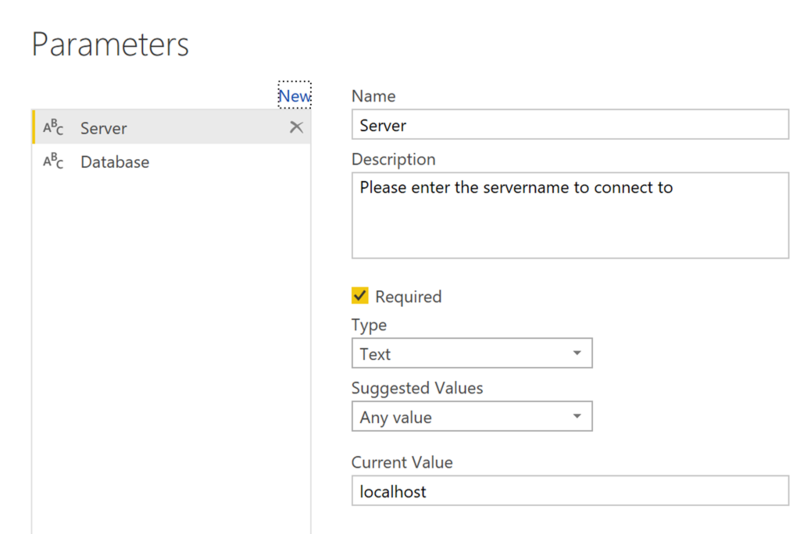 Unfortunately you have to specify a Database on the server for each connection to SSAS while this should be an optional argument in Analysis Services.Database. I have asked the M folks to put it on the backlog but I can live with this for now, this scenario is not that common. 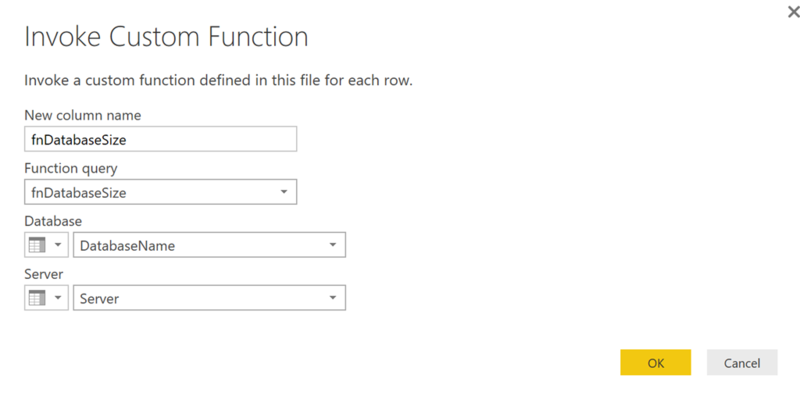 Fortunately Power BI desktop automatically recognized the parameters in my function and asks me which column values it should use to enter the variables. This I now can expand and clean up to get the full results. This gives me all the information I need for all the databases on my server. Unfortunately you will probably have gotten an error message about data privacy or firewall, what happens is that Power Query is trying to prevent some sort of data injection. Based what we are doing here I could also have used information from you SSAS server and pass that over to some web service and steal some data so Power Query prevents that. To solve this you can go to options, Privacy, Always ignore Privacy Level settings. This will allow these queries to call each other. I ended up with 6 queries, 2 parameter. The DBSize function is the base for my function, for this one I disabled loading data as I am not planning to use it. Now I can start creating the reports as described in the my other blog post here. As last step I saved the report as a template so other users can start clean without my data, you can do this through File, Export, Power BI template. To get rid of the inappropriate Database parameter one could use AnalysisServices.Databases(Server). Why do you restrict the compatibility level of the databases? DISCOVER_STORAGE_TABLE_COLUMN_SEGMENTS does work with lower levels as well. Hi Kasper. Coparing with VertPaq Analyzer, from Marco and Alberto, I noticed your report give similar value to the Dictionary Size of theirs. Have you compared both? What is the difference of getting DISCOVER_OBJECT_MEMORY_USAGE and DISCOVER_STORAGE_TABLE_COLUMN_SEGMENTS?